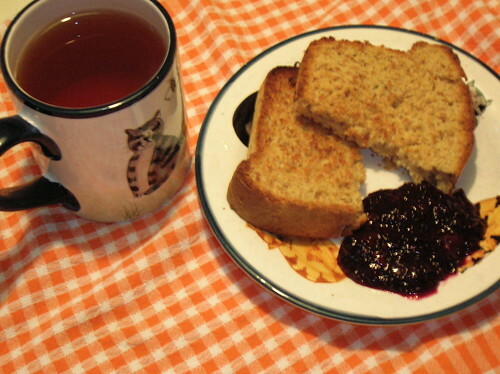 Simple Pleasures: Toast, Jam and Tea! Sometimes simple is simply the best! I’ve been on a ‘toast kick’ lately and can’t seem to get enough of ‘burnished to perfection, golden NOT brown please’.. LOL! I am including my quick version for fruit spreads/jams/preserves with this post. I came up with the idea when I wanted the taste of homemade (yes, there is a big difference from store bought) jam in a big hurry, without all the fuss. The lemon zest adds a nice zesty flavor and you can have fresh preserves in less than 30 minutes from start to finish, with this quick and easy recipe. Don’t you just love that song? A quick and easy alternative to time-consuming jam recipes. Low in sugar too. Try it on toast, muffins, with yogurt or even ice cream!!! Makes approx. 2 cups. In a medium saucepan, combine blueberries, frozen grape concentrate and lemon rind. Bring to a boil and simmer gently over low heat for 10- 15 minutes, until fruit is soft but not liquefied. Add tapioca and simmer 5 more minutes, until tapioca is fully dissolved and mixture has thickened. Spread will thicken more, after it is chilled. Remove from heat and cool slightly. Pour into covered container/jars and store in refrigerator. Will keep for up to two weeks, if refrigerated. Note: I use glass jars for storage. To reuse, clean and sterilize jars and lids, for each new batch of jam. Strawberries, raspberries, other types of berries in season can also be used. Follow directions as above. Fresh and zesty and not too sweet. Makes approx. 2 cups. In a medium saucepan, combine pineapple and juice, with rind of orange. Bring to a boil, reduce heat to medium-low and stir in tapioca. Simmer uncovered for 5 minutes or until thickened and tapioca is completely dissolved. Remove from heat. Cool slightly. Store as for blueberry spread. Recipes from Not Just for Vegetarians, Delicious Homestyle Cooking, the Meatless Way. © Geraldine Hartman. All rights reserved. Thank you for the spread recipes. They seem easy enough for me to attempt. And the photo is perfect, even the orange checkered tablecloth. Reminds of the red checkered cloth on our kitchen table when I was a child. Your site header is absolutely devine. Mitzi and you of course, just darling. It is so bright and inviting. The colors are particularly enhancing. (notice my big words) lol The bread I must try and will also try the blueberry spread. Thanks again for your very entertaining blog. LOVE THE NEW LOOK here, G! Gotta change my blog name for you. That’s a most toast post too, by the hostess with the mostess here. Blueberry spread with NO ADDED SUGAR! How much do i love that? Toast and marmalade truly a delicious breakfast with a spot of tea! Hi Elaine, Glad you liked the new look. Let me know if you try the bread/jam….hope you are using NJFV for lots of cooking days! Hi K, Like this rhyming comment, very clever. Wishing you a great weekend too. Hi JLB, Welcome back! Yes, the Quickie Oatmeal Bread is in NJFV, also the jam recipes. I hadn’t made this bread for a long time but it turned out so yummmy and its nice to get back to ‘scratch’ again, My breadmaker is now deceased LOL…Im doing fine without it though, working on more ‘scratch’ recipes all the time. Hi Diana, Indeed!!! I still like coffee too much but tea makes for a nice change, especially with toast and jam. I love toast and jam, too, and am actually eating quite a bit of it these days because I’m having appetite issues. I’ve been making my own bread, which I must say is excellent toasted. As for jam, my former roommate gave me a jar of strawberry rhubarb jam that is really good. Your pineapple-orange marmalade looks excellent! hi, i’m the novice posting … i would love to make bread, eventually, but i think i can handle the jam thing in the meantime. i have a question about “minute tapioca”. what is it? where do i find it in a store? also, once i make the jam, how long will it keep? Hi GLG, Thanks for stopping by. Minute tapioca is available in most grocery stores, in the baking section. It’s a good thickener for pies, some cream soups and of course, works great in this quick jam. It is much finer than regular tapioca that is used for pudding etc and dissolves quickly. Oh yeah.. I live on toast.. I might just have to give that spread a try… mmmmmm… now I’m hungry! Your ideas are very simple and good. I also have a simple blueberry jam recipe. * A REBLOGGED POST FROM THE ARCHIVES. IF YOU”VE BEEN LOOKING FOR A VERY EASY JAM RECIPE WITHOUT ADDED SUGAR, YOU MIGHT WANT TO GIVE THESE A TRY. SIMPLE AND DELISH. Hmm, toast and jam: the ultimate comfort ad cozy food. I love your plate and mug, what a a great photo! Yes, beautiful header and that looks yummy!